Leben Sie wie ein Londoner in einer stilvollen und komfortablen Wohnung an der Spitze eines viktorianischen Herrenhauses in einem echten Londoner Viertel. Ideal für eine Familie von 4, zwei Paare, Geschäftsreisende, Gastwissenschaftler oder diejenigen, die in London arbeiten. Fünfter Stock, sehr ruhig, atemberaubende Aussicht von jedem Fenster. 2 Minuten zu Fuß zur U-Bahnstation Archway (Northern Line). Wunderbares Tageslicht bei Tag und schönes Licht bei Nacht. Offener Grundriss, in der Nähe von Geschäften und Restaurants, große Schränke und Power-Dusche im Badezimmer. Wir haben gerade dieses Eigentum von seinem langen Inhaber gekauft und es hat eine lange Geschichte von zufriedenen Kunden. Wir sind so aufgeregt, diesen wundervollen Ort mit Ihnen allen auf der Suche nach einem komfortablen und erschwinglichen Ort in London zu teilen. It’s a wonderful place. Second time I’ve stayed and I love it. Arune was very helpful, and everything went as smoothly as could be expected. Great experience! We loved our stay at this apartment. The convenience of having a major tube station just a two minute walk away was amazing, we could get anywhere in central London in just 20 minutes! The apartment itself had everything that we could've asked for, from an ironing board to extra food in the cupboards. Cathy was incredibly helpful when we were settling in, more than we expected for a Christmas arrival. Overall, we'd highly recommend this property! We know where we are going to stay on our next trip to London! Thank you Andrey for your kind words! We look forward to having you stay again! We offer a 10% discount for returning guests. I chose this property because of the amazing views and the many positive reviews it had received in the past. We were not disappointed. The new owner honored the previous booking details and was very easy to work with and had great communication. The apartment is exactly as pictured, very comfortable, the kitchen is well equipped and had everything we needed for our stay. The view is wonderful and perfect to sit at the table and have coffee in the morning. The neighborhood is great, not touristy which we love. It is so close to the tube station and links to anywhere we needed to go in London. There are several restaurants in the neighborhood, and groceries nearby, it has everything you need right there. It is in the city, there is some street noise which we're not used to and bring ear plugs when we travel. The apartment building occupants are very quiet. It is a 5th floor walk up as advertised, so pack accordingly. We had a wonderful stay and wouldn't hesitate to stay again in the future! Thank you so much for the kind words and enthusiasm for our lovely flat! Since taking over from the previous owner, we have been able to continue to share this wonderful little oasis in the sky with those seeking a unique travel experience in London. Happy guests equals happy owners! The location was great! We bought a travel card and easily explored all of London from our very close subway station. The apartment with its many stairs had the most amazing view. It was great making a coffee in the well equipped kitchen each morning and looking out over the city. The apartment was quiet, with lovely bedding and two very comfortable mattresses. There were a couple of small supermarkets nearby and some restaurants. We made many meals at the apartment and always had what we needed to cook a great meal. This was our first experience using home away and it was a great one. Our girls will fondly remember their first stay in London and the place we called home. Thank you Alexie for the kind words and for staying with us! We want all of our guests to feel at home in our flat and it looks like we succeeded! What we like most about the flat is that it is in a real London (not tourist) neighborhood but it is only a 15-20 minute tube ride to central London. If you should ever return to London, we offer a 10% discount for return guests! This was our first rental using VRBO and we were advised to find a property with great reviews of the property and landlord. The property was sold just before our vacation and the new landlord (Cathy) was extremely flexible in honoring all the arrangements from the previous owner (Lynn). Having completed our week long rental at the Mary Poppins Penthouse, we were not disappointed. Our two boys, ages 15 and 18, had their own space/room and we had ours. The flat was as advertised on the website and met all of our functional needs. The property manager met us at the door and gave us an overview of the flat, and also stocked the flat with fresh fruit, milk, cheese, and snacks for us. 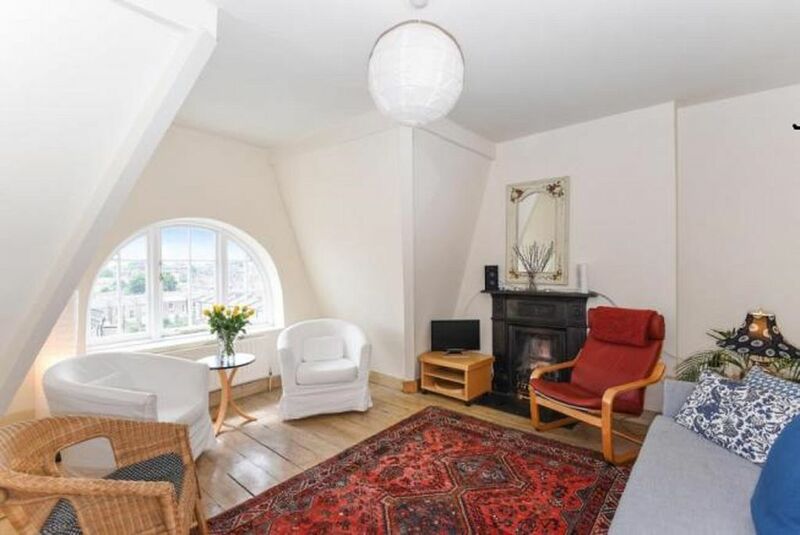 We highly recommend staying at this property, which is less than 2 blocks away from the Tube with a market just across the street. Thank you Michael for the very kind words! I am so happy you enjoyed your stay at our wonderful flat. Should you ever return to London, there is a 10% discount for returning guests.